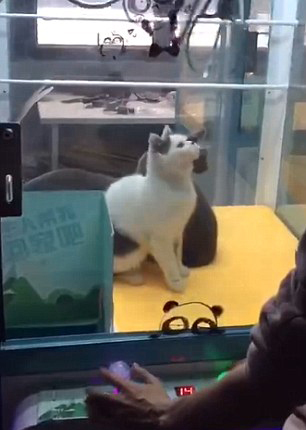 People are voicing their anger after images emerged appearing to show live cats inside an arcade claw machine. 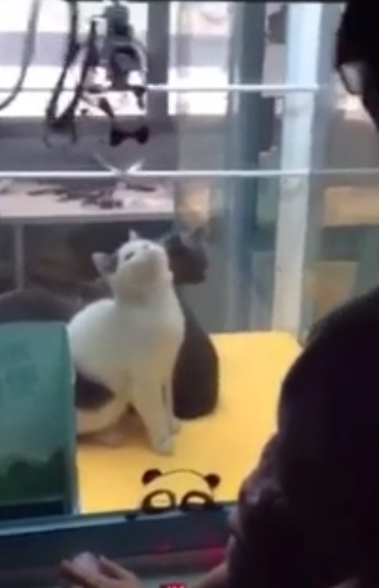 An unbelievably cruel discovery has been made in an arcade machine in a Chinese shop, as people realised the prizes up for grabs were actually real, living, breathing cats. 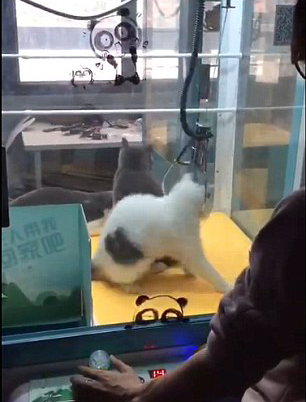 The mean game which involves grabbing at a prize with a metal claw and dragging it to the chute – and in this instance picking up a live cat – has apparently sparked mass outrage from internet users, Chien TV reports. 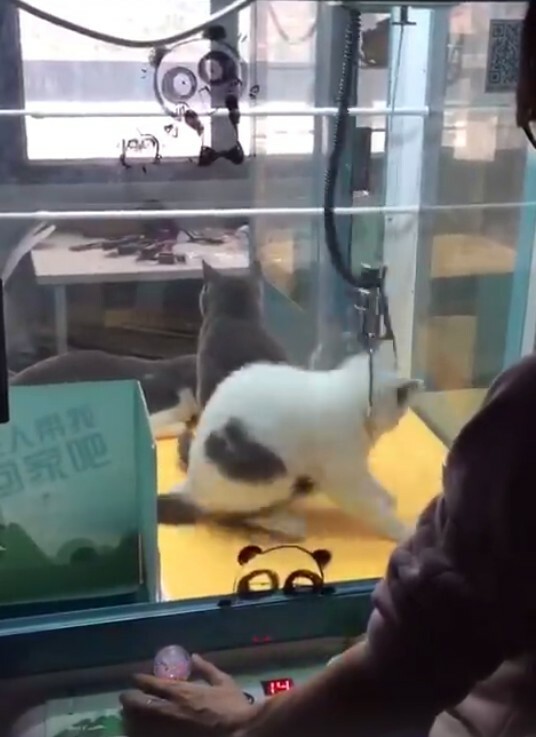 The awful clip – which was recorded on an unknown person’s phone – shows players trying to scoop up a cat and send it into the chute ready to take home. 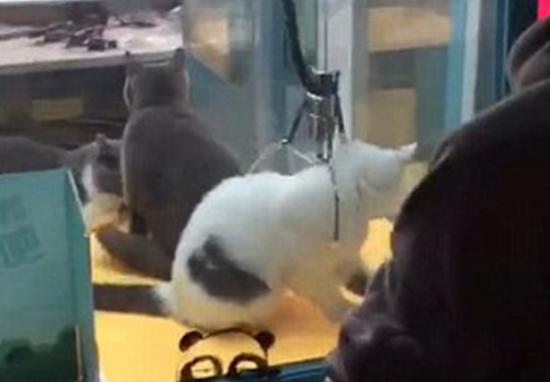 Horrendous footage shows three poor cats trapped in the glass cased arcade machine, with very little air and the prospect of being ‘won’ and made to go to a strangers home very much on the cards. As the player starts to move the claw, the cooped up cat begins to look scared – with very good reason too – as the metal prongs descend towards its neck, ready to winch it up. Luckily – if you can call it that – the cat managed to escape the claw’s grip this time and got to stay another day with its frightened looking feline friends. (The cat is) too fat. The barbaric footage was first shared last month and has quickly spread, causing a stir on Chinese social media, although it is not clear which shop the machine belongs to. It seems this bizarre – and if it was in the UK, highly illegal – game has been met with mixed responses from viewers, with some claiming they’d love to have a go and others appalled at such cruelty. Look at the cat’s shocked face, how cute. I want to try! Tell me where is this and I will bring some toys. Obviously others felt differently about the machine and were disgusted the poor cats could be treated in this way. The sharp claw will hurt the cats! I am scared. I don’t really understand how anyone can consider this a game? It just looks ridiculously mean to me. Hopefully someone will rescue them or they’ll find a way to get back out of that chute… Poor things.